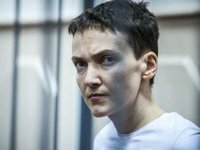 Ukrainian President Petro Poroshenko has urged President of the International Committee of the Red Cross (ICRC) Peter Maurer to step up efforts to free Ukrainian pilot and MP Nadia Savchenko. "President Poroshenko has called on Red Cross President Maurer to intensify efforts for the immediate release of Nadia Savchenko," Poroshenko's press secretary Sviatoslav Tseholko posted on Twitter on Tuesday. As reported, Poroshenko is on a working visit to Switzerland. The ICRC headquarters are located in Geneva, Switzerland. Savchenko has been illegally detained in Moscow since September 24, 2014.